DEAR PAPERLICIOUS: hi, there or hi there? I would prefer no comma. With the comma it seems the "there" is a beginning of a longer sentence instead of just a greeting. Example: hi, there seems to be a problem with your credit card. do you have another form of payment? No comma. What Mary said ^. Love the card, though. You've done it again -- made something utterly fabulous out of such a simple concept. I know it's proper to use the comma, but change happens... new words and such. Someday the comma may become archaic. I absolutely love the bright yellow envelope. Afraid I've gotten to where I don't decorate the envelopes much anymore, so color is a good way to go for me. Agree that stamp surgery should take place! I prefer no comma. It just seems better that way. 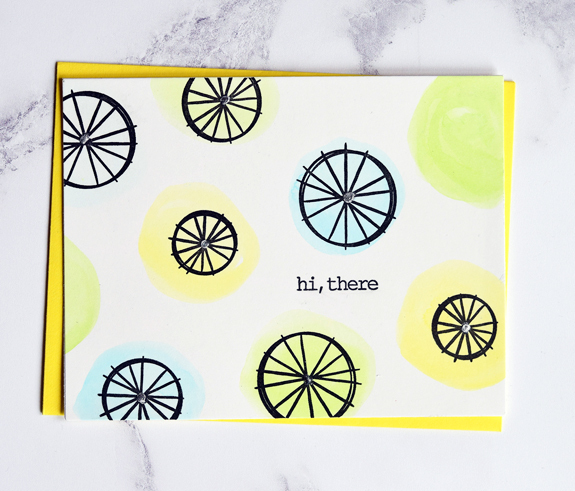 Love the bright and happy card. Cute card! Where do you buy your colorful envelopes? I like the pop of color! thanks. I love these. I get them at a paper source in my neighborhood. I like the deep V flap. Gina K also sells some colorful envelopes! "there" is taking the place of a proper noun, but is NOT, so no comma. If it were a proper noun, such as "Katy," there WOULD be a comma: "Hi, Katy." So says this lifetime copy editor...and Chicago Manual of Style. thanks. I get them from Paper Source. there is a store in my neighborhood and every once in a while I walk over and pick up a different color. Those slightly acid pastel colours look fab - with the graphic wheels this works perfectly for either gender. No comma, definitely. And I am a slight grammar nerd. Carry out that surgery! !